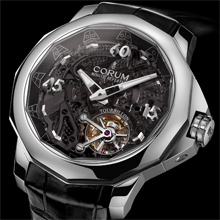 First presented in 2009 to celebrate the 50th anniversary of this legendary collection, the Corum Admiral’s Cup 45 Minute Repeater Tourbillon is now presented in a grade 5 titanium case. This material which is ultra-resistant and extremely hard to machine is endowed with the ideal physical properties to ensure perfect resonance of the notes emitted by the striking mechanism. A fine means of further enhancing this prestigious complication that remains the exclusive preserve of the greatest traditional watch manufacturers. The extremely rare integration of a minute repeater inside a watch with a maritime vocation combines the strengths of two worlds. Night and day, from sunrise to sunset and from morning and evening colors, life on board ship is traditionally governed by the ringing of bells. The idea of equipping the Admiral’s Cup with the oldest horological complication of all is a means for Corum to pay tribute to the world that inspired this legendary watch. The Caliber CO 010 movement powering the Admiral’s Cup 45 Minute Repeater Tourbillon called for two full years of development that enlisted the talents of around ten of Corum’s finest watchmaking craftsmen. Over 160 hours have been spent on decorating, assembling and adjusting the 331 parts of this exceptional mechanism. Each has been conceived and developed to guarantee the accuracy of the watch, and the beauty of its tone in terms of “power” (volume in decibels), its “precision” (the correct pitch of its notes), its “richness” (determined by the number of partial tones or overtones) and its “reverberation” (the duration of each note). 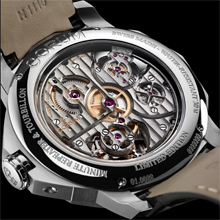 One of the crucial factors in this equation is the grade 5 titanium case. In addition to its excellent resistance to corrosion – a particularly precious quality within a maritime environment – this alloy was chosen for its excellent acoustic qualities. The pure, crystal-clear sounds emitted are endowed with a rare level of intensity and admirably highlight the complexity of the minute repeater mechanism developed by Corum. The minutes rack positioned at the heart of the striking system has been inverted compared with traditional minute repeaters in order to give each note added strength and precision. It has also been enlarged to provide a larger angle of lift for each of its teeth, thereby extending the time between notes. The hammers hitting the gongs in order to produce the sound are made from ultra-resistant hardened steel. Fixed to these hammers are counter-springs specially designed to achieve the best possible balance between striking strength and speed. While the minute repeater mechanism is sounding, the overall cadence is regulated by the rotation of an inertial flywheel that is visible on the back of the movement. The gongs, made from an alloy based on a composition and thermal treatment that remain a jealously guarded secret, have been adjusted to sound the hours on an A note and the minutes on a C sharp. These two notes are no random choice: their specific sequence forms a major third (two tones) creating a more cheerful harmony than that of a minor third (one and a half tones). The overall precision is ensured by a tourbillon with a silicon escapement and lever, a guarantee of both reliability and longevity. The result of these intense years of craftsmanship is a micromechanical masterpiece measuring 14¼’’’ (32 mm in diameter) and 5.35 mm thick. This hand-wound movement boasts an exceptional 100-hour power reserve. Considerable attention has also been lavished on the elaborate hand-finishing of each surface: the wheels and pinions are circular satin-brushed, the steel parts (and particularly the strike hammers and the tourbillon bridge) are mirror-polished with zinc, the mainplate is circular-grained, and the bridges are decorated with a Côtes de Genève motif. The creativity and meticulous care devoted to conceiving and crafting Caliber CO 010 are reflected in the exterior of the Admiral’s Cup 45 Minute Repeater Tourbillon. In order to highlight the value of the movement driving this model, Corum has chosen to replace its dial with a smoked PVD-treated sapphire crystal. The latter is even broader than on the previous model and provides stunning views of the intricate minute repeater and tourbillon mechanisms. Its grey-colored treatment, emphasized by the monochrome nautical pennants on the flange, lends this model an understated and yet highly technical nature. 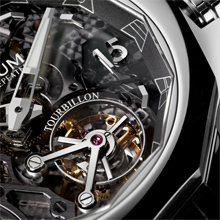 The crystal is also engraved with the inscriptions “Corum”, “Minute Repeater” and “Tourbillon”. The 45 mm-diameter case is immediately recognizable thanks to its famous polished satin-finished 12-sided bezel. The bezel itself also features a hidden function. For such a sporty model, it would indeed have been risky to have the minute repeater slide protruding from the case middle, since it might get snagged or knocked against something and thereby damage the mechanism. Mounted on steel runners and delrin blocks to reduce friction, the ingenious bezel of the Admiral’s Cup 45 Minute Repeater Tourbillon serves to wind the minute repeater function by a clever 27-degree clockwise rotation. Water-resistant to 30 meters thanks to this original system, the Admiral’s Cup 45 Minute Repeater will be issued in a strictly limited production run of 15.